This design was submitted for consideration to the Colorado Governor's office in 2004. 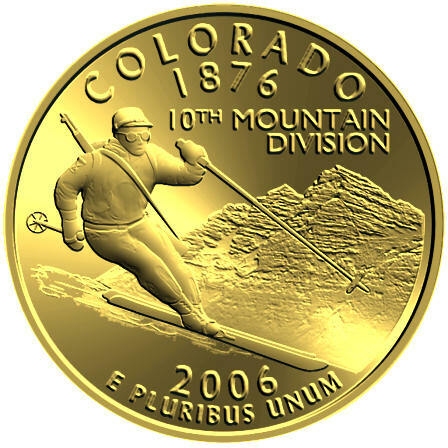 It was revised by the US Mint and became one of five finalists for the Colorado quarter. This is the original version before the US Mint modified it. The 10th Mountain Division was the famous "soldiers on skis" US Army unit that fought in WW2. They trained in the Colorado Rockies and were based at Camp Hale near Leadville. After the war, some of the soldiers returned to Colorado and were instrumental in developing the state's ski industry. The famous Maroon Bells peaks rise in the background. For more information, click the "Alternate State Quarters" entry in the "Browse Categories" section (above left). Diameter: 25mm (0.5mm larger than a regular US quarter dollar). Final Mintage: See Home page.